In September - October 2004 I went on a 5 week holiday to Tanzania, Zanzibar and Kenya. In Tanzania I went on safari and did several cultural tours and spent some time in various cities and villages. On Zanzibar I spent some time in lovely Stone Town and I relaxed on the beach of Bwejuu on the east coast. In Kenya I visited a former co-worker who does volunteer work there. I will try to put my travelogue online as soon as possible. The website of the Tanzania Tourist Board may come in handy to people still planning their trip to Tanzania. It's been a while since I went backpacking, so the travel bug was itching big time. High on my wish list were (are): Brazil, Ethiopia, Ghana, Cameroon, Mozambique... and Tanzania. 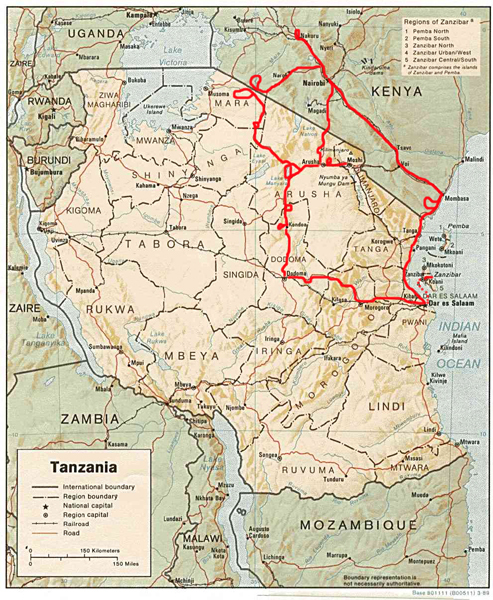 I read up on all of them and finally decided on Tanzania (and Zanzibar). Akke, my former colleague, was due in Kenya around the same time so I decided to pay her and her projects a visit as well. Brazil is still a bit to intimidating for me as a solo female, I'd rather go there in a pair. Also I'd like to have more time to really see lots of places without rushing. And I want to speak some basic Portuguese before going there, which I am intending to learn starting about now (spring 2005). Tanzania had all I wanted from a holiday at this point in time: culture, I'm very interested in the way of life of the Tanzanians, fantastic wildlife (I love big cats and a lot of other animals as well) and flora, mountainous areas, beaches, museums, volcanoes, colonial architecture, etc. I am also interested in the slave trade that took place there.